Curry Honda uses debris left by work crews to pitch wheel-and-tire plans. Since displaying the jar, 78 percent of car buyers are opting for a plan. The grief and aggravation of running an F&I office while the dealership is being renovated can be maddening for managers and shoppers. Keeping customers cool, calm and collected -- let alone receptive to the aftermarket menu -- can be a bigger challenge than serving decent coffee in a makeshift customer lounge. But F&I manager Chris Brunner of Curry Honda in Chicopee, Mass., found a way to spur sales of wheel-and-tire protection plans during the store's recent renovation. His advice: Keep your eyes on the nuts and bolts. His boss, Howard Sackaroff, explains what happened. 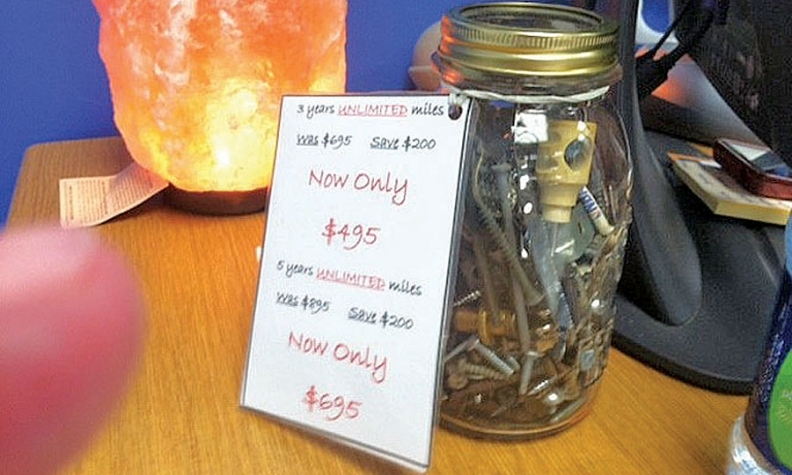 "One of my best F&I guys went outside, gathered all the screws, nuts and bolts from the construction project, and put them in a jar on his desk to show people the road hazards. He tells them, 'You might not make it out of the parking lot,''' says Sackaroff, general manager of Curry Honda and Curry Nissan, both in Chicopee, about an hour's drive west of Boston. The result? Curry Honda's penetration rate on wheel-and-tire protection jumped to 78 percent of new- and used-vehicle sales from 51 percent before construction began, Sackaroff says. A three-year plan for wheel-and-tire protection costs $495; a five-year plan fetches $695 he says. Seeing the jar of potential road hazards combined with an explanation that it can cost about $550 to replace an aluminum wheel and tire generally closes the deal with most customers, Sackaroff says. "That jar was a great idea," he says, acknowledging he first heard it from someone who once was an F&I manager. Sackaroff says the idea works so well, he plans to use a similar jar in the F&I office at his Nissan store.